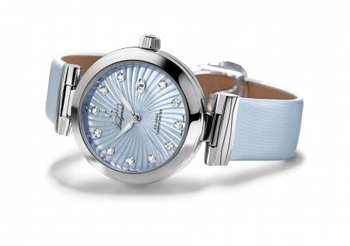 The Hall of the House of Basel 2013 Biel / Bienne present new Ladymatic watches feature dials daring and fascinating. Ladymatic has always been a prestigious example of the class and the creativity of the brand since its launch in 2010. The new Omega Ladymatic watches are fitted with polished steel case 34 mm with ceramic white, black or pink in the Cotes de Geneve and the inside of the case. They are available with matching leather strap satin-brushed or polished steel bracelet. The dials, with their enchanting reason Supernova, are made even brighter by the 11 indexes set with diamonds in 18k white gold frames a diamond shape. 3 is positioned at a date window. The hands for hours, minutes and seconds in the form of alpha are made of polished white gold 18 carats. The hour and minute hands are also coated with white Super-LumiNova. These delicious dials, new versions of pink, gray and purple, are protected by a scratch-resistant sapphire crystal with anti-reflective treatment on both sides. The diamond “Omega brilliant cut” on the screw-down crown is accompanied, at the option of the customer, with a shining bezel adorned with a diamond-paved snow or elegant and simple polished steel bezel. The polished caseback has a sapphire crystal that allows you to admire the Omega Co-Axial caliber 8520 is mounted inside chronometer certificate. The Co-Axial escapement, combined with the unique Si14 silicon balance spring Omega is covered by a warranty of four years.